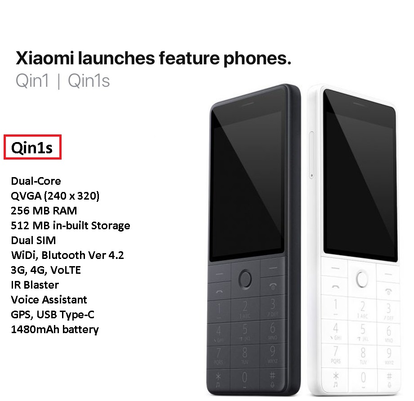 Chinese handset maker Xiaomi has recently launched its two 4G phones in China, one of which is named QIN 1 and the other is QIN 1S. If you talk about the display, this phone comes with 2.80-inch screen size. Which gives a picture quality of 240 x 320 pixels. Well, the resolution is not so bad for mobile phones with screen sizes of 2.80. MediaTek MT 627010 core processor has been used, the ram is up to 8 MB and the internal storage is up to 16 MB. It is dual SIM supported phone. You can use two nano-SIM in it. In term of connectivity, the user gets Bluetooth version 4.2 and it also supports WiFi. This is the 2G feature phone. If you are not happy with this variant of Qin series. There is another choice named Qin 1s. The size that is given in qin 1, the same size will be available in this phone as well as Dual SIM option too. In case of processor and RAM, there will be a slight difference here. Dual-Core Spreadtrum SC9820E processor has been used in this model. It will be available with 256 MB RAM and 512 MB internal storage. Talking about connectivity, this phone is upper hand in term of the connectivity, because here you will find all the connectivity options like 3G, 4G/LTE, VoLTE, Bluetooth ver 4.2 even GPS too. According to sources, you will also find Corning Gorilla Glass but which type of it will be currently no information available. And the most important thing is that you will get the feature named IR Blaster inside this phone. Means you can use it as a remote for any gadget (remote supported) in your home. In this phone, you will find a voice assistant which AI based. You can translate around 17 languages using a single command. The battery capacity of the phone is 1780 MHz which gives talk time of 7 hours which is non-removable. Although play store not supported but externally, you can install apk files and use apps like facebook, twitter, youtube etc. Here user gets USB Type-C. It also packed with 3.5 mm audio jack. The only drawback is that no camera is given. Rest the phone is good as the reported configuration indicates. It can be launched globally in the month of September. The price can be between 2k to 3k. Overall, if it launches in India, it can give tough fighting to JIO Phone, but the lack of camera will not allow it to stay in the market against JIO 2.